Editor’s note: This review was originally published in the June 2014 issue of Bike. Cannondale's line of Scalpel mountain bikes has long been a mainstay of the cross-country race scene. Like their namesake, the Scalpels have a reputation for precision. They are also, however, notoriously expensive. While you can still pillage your retirement fund to the tune of $10,830 for the top-tier Carbon Black model, Cannondale offers several more affordable models as well. The most obvious distinction between our Scalpel 29 3 and its pricier siblings is its all-aluminum frame. At 28.6 pounds, the Scalpel 29 3 is not the flyweight model you might expect from a bike in this class. We tested a 23-pound carbon version a few years back and it was like riding a rocket made of pixie dust. By contrast, there's no hiding the fact that this cost-conscious Scalpel is a few pounds heavier than some similarly priced competitors. This aluminum Scalpel, however, is no pig out on the trail. It covers ground at a remarkable rate. Even the feeblest efforts on the pedals reap serious accelerations. Handling is still razor sharp as well. There's not a weak, flexy link anywhere on this bike. Out back you have the 142×12 rear through axle. In the center, 15-millimeter axles in the rear swingarm and swing link pivots eliminate any potential wiggle. And up front, the crazy-stout Lefty fork makes the typical 4-inch-travel XC fork feel downright noodly. 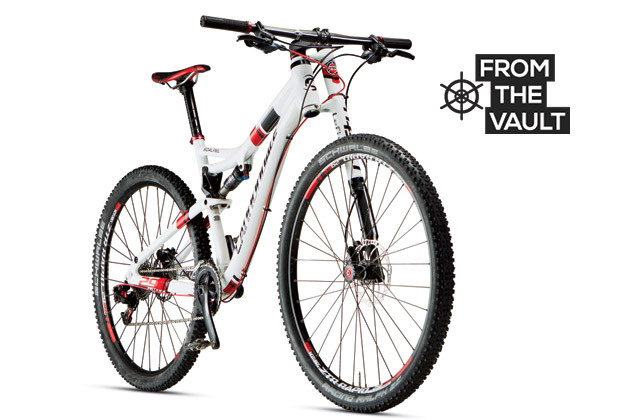 This is a cross-country bike with the stiffness of an all-mountain brawler. The Scalpel navigates switchbacks and twisty sections of trail with relative ease thanks to the very tight wheelbase (44.2 inches on a size large) and the steep, 71-degree head angle. That said, standover clearance could be improved and while Cannondale clearly tried to keep the handlebar height low by spec'ing both a flat bar and a negative 15-degree stem, some riders will want the bars lower yet and may have a hard time making that happen. The bikes ship with a few headset spacers installed, which, with a mallet and some cussing, can be removed for further stem slamming. However, when you factor in the 4.8-inch headtube, Lefty upper clamp and required HeadShok spacer, you're still looking at some serious stack height. Shorter riders in particular might struggle with getting the fit just right. On the whole, though, the Scalpel 29 3 delivers.